Ukrainian technology satellite. Used in development of aerodynamic systems for stabilization and orientation of spacecraft. Also carried military optical equipment experiments. 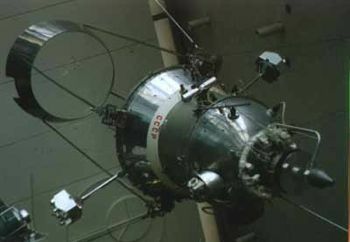 Technology, aerodynamic stabilization satellite built by Yuzhnoye, Russia. Launched 1967 - 1970. Used DS Bus. Status: Operational 1967. First Launch: 1967-03-21. Last Launch: 1970-01-16. Number: 2 . Gross mass: 375 kg (826 lb). The spacecraft was known as the "space arrow" due to its extended aerodynamic skirt stabilizer. This was the first spacecraft to use aerodynamic attitude control. It was also the only DS-series satellite to be equipped with attitude control. Family: Technology, Technology satellite. Country: Ukraine. 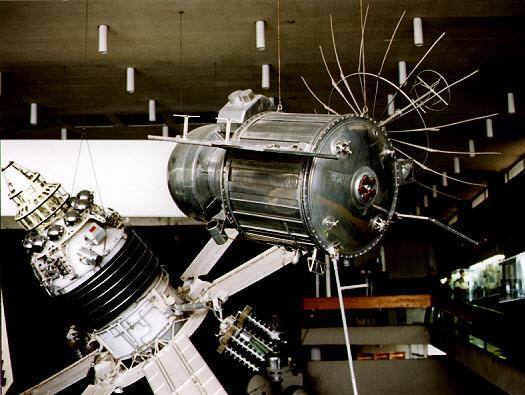 Launch Vehicles: Kosmos 2, R-12, Kosmos 11K63. Launch Sites: Kapustin Yar, Kapustin Yar LC86/1, Kapustin Yar LC86/4. Agency: MO, Yuzhnoye. Bibliography: 2, 6, 99, 12258. 1967 March 21 - . 10:07 GMT - . Launch Site: Kapustin Yar. Launch Complex: Kapustin Yar LC86/1. LV Family: R-12. Launch Vehicle: Kosmos 11K63. Cosmos 149 - . Payload: DS-MO s/n 1. Mass: 321 kg (707 lb). Nation: Russia. Agency: MO. Program: DS. Class: Technology. Type: Navigation technology satellite. Spacecraft Bus: DS. Spacecraft: DS-MO. Completed Operations Date: 1967-04-08 . Decay Date: 1967-04-07 . USAF Sat Cat: 2714 . COSPAR: 1967-024A. Apogee: 284 km (176 mi). Perigee: 246 km (152 mi). Inclination: 48.40 deg. Period: 89.80 min. Used in development of aerodynamic systems for stabilisation and orientation of spacecraft. Also carried military optical equipment experiments..
1970 January 16 - . 10:59 GMT - . Launch Site: Kapustin Yar. Launch Complex: Kapustin Yar LC86/4. LV Family: R-12. Launch Vehicle: Kosmos 11K63. Cosmos 320 - . Payload: DS-MO s/n 3. Mass: 375 kg (826 lb). Nation: Russia. Agency: MO. Program: DS. Class: Technology. Type: Navigation technology satellite. Spacecraft Bus: DS. Spacecraft: DS-MO. Completed Operations Date: 1970-02-10 . Decay Date: 1970-02-10 . USAF Sat Cat: 4301 . COSPAR: 1970-005A. Apogee: 326 km (202 mi). Perigee: 247 km (153 mi). Inclination: 48.40 deg. Period: 90.20 min. Used in development of aerodynamic systems for stabilisation and orientation of spacecraft. Also carried military optical equipment experiments..